While I’m not a complete Luddite, I don’t usually write on a computer. There are times when a fleeting bit dialogue or description is looping through your mind, wrenching your emotions, and you need to get those ideas down on paper fast. Before they’re gone. And that’s where pencils come in. In a pinch, anything will do. But if you have the opportunity to properly stock your writing space beforehand, you’ll want something better than those cheap, harsh yellow writing sticks forced on you as a school kid. The last thing you want to worry about is a brittle tip, bad grip or useless eraser jerking you out of the writing flow. You need a good pencil. One that will work unobtrusively and professionally with you, enabling you to get those words down as smoothly and quickly as possible. You need a tool you can depend on. In my humble opinion, that tool is the Mirado Black Warrior. Without question. Now, don’t get me wrong. I’m not the sort of pencil connoisseur to use pretentious French words (whoops — too late) and imply that using the ideal writing utensil is some kind of transcendental experience. Writing is writing, regardless of how the words get onto the paper. But I always keep coming back to these slick black pencils. 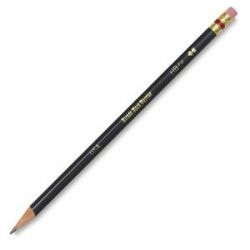 Personally, I’d never say a Mirado Black Warrior pencil “smells heavenly.” But, now that I think about it… (sniff, sniff) Wow, that does smell good. So do yourself a favor. Next time you’re stocking up on office supplies (“back to school” is quite possibly my favorite time of year), get yourself a pack of Mirado Black Warrior pencils. If they don’t do anything for you, pass them along to the first budding author or sketch artist you meet. You’ll have a friend for life.